The West Bank (Hebrew: הגדה המערבית, Hagadah Hamaaravit, Arabic: الضفة الغربية‎, aḍ-Ḍiffä l-Ġarbīyä), is a landlocked territory on the west bank of the Jordan River in the Middle East. It was captured by Israel from Jordan in the 1967 Six-Day War and is considered by the United Nations Security Council, the United Nations General Assembly, the International Court of Justice, and the International Committee of the Red Cross to be under Israeli occupation. After the dissolution of the Ottoman Empire, this territory was part of the British Mandate of Palestine. The 1948 Arab-Israeli War brought an end to the Mandate. The West Bank was captured and annexed by Jordan, and the 1949 Armistice Agreements defined its interim boundary. From 1948 until 1967 the area was under Jordanian rule, though Jordan did not relinquish its claim to the area until 1988. The area was captured by Israel in the 1967 Six-Day War, although, with the exception of East Jerusalem (and unlike the Golan Heights), it was not annexed by Israel. The West Bank is currently considered under international law to be de jure a territory not part of any state. 40% of the area (including most of the population, 98% of the Palestinian population) is under the limited civilian jurisdiction of the Palestinian Authority, while Israel maintains overall control (including over Israeli settlements, rural areas, roads, water, and border regions). Settlements (darker pink) and areas of the West Bank (lighter pink) where access to Palestinians is closed or restricted. Source: United Nations Office for the Coordination of Humanitarian Affairs, January 2006. According to Palestinian evaluations, The West Bank is inhabited by approximately 2.4 million Palestinians. According to a study presented at The Sixth Herzliya Conference on The Balance of Israel’s National Security there are 1.4 million Palestinians. There are over 400,000 Israeli settlers (260,000 not including those in East Jerusalem), and small ethnic groups such as the Samaritans, living in and around Nablus, numbering in the hundreds or low thousands. The Jews in the West Bank live mostly in Israeli settlements, though populations exist in Arab neighborhoods of Jerusalem and Hebron (though in Hebron, the Israelis live separated by fences and barricades). Interactions between the two societies have generally declined due to the recent security problems, though an economic relationship often exists between adjacent Israeli settlements and Palestinian villages. Approximately 30% of Palestinians living in the West Bank are refugees or their direct descendants, who fled or were expelled from Israel during the 1948 Arab-Israeli War (see Palestinian exodus). The accuracy of the total population figures are disputed according to a study presented at The Sixth Herzliya Conference on The Balance of Israel’s National Security. The most densely populated part of the region is a mountainous spine, running north-south, where the cities of Jerusalem, Nablus, Ramallah, Bethlehem, and Hebron are located. Jenin, in the extreme north of the West Bank is on the southern edge of the Jezreel Valley, Qalqilyah and Tulkarm are in the low foothills adjacent to the Israeli coastal plain, and Jericho is situated near the Jordan River, just north of the Dead Sea. East Jerusalem is not recognized by Israel as a separate entity from western Jerusalem as Jerusalem as a whole is currently claimed to be part of the Israeli capital. East Jerusalem is the location where Palestinians hope to establish their future capital. 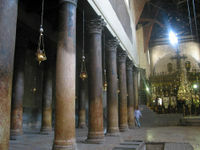 All existing definitions of East Jerusalem include the Jerusalem Old City and some of the holiest sites in the Jewish, Muslim and Christian religions, including the Western Wall, the Temple Mount/ Noble Sanctuary (containing the Dome of the Rock and the Al-Aqsa Mosque), and the Church of the Holy Sepulchre. Ma'ale Adummim (Hebrew: מעלה אדומים) is an Israeli settlement in the Judea region of the West Bank, east of Jerusalem. Founded in 1976, it is now sometimes considered to be a suburb of Jerusalem, mainly because most of its population works in Jerusalem. Ma'ale Adummim is one of the largest Jewish communities in the West Bank. As of 2005, the estimated population of Ma'ale Adummim is 32,000. Ma'ale Adummim is seen by Palestinians as a threat to the territorial continuity of any future Palestinian state, given its strategic situation between the northern and southern areas of the West Bank. Ramallah is generally considered the most affluent and cultural as well as the most liberal, of all Palestinian cities. Ramallah (not to be confused with the Israeli city of Ramla) is a major Palestinian cultural and economic centre, and is the location of Yasser Arafat's burial spot. The city is located close to the biblical Bethel, the location where Jacob had his divine revelation dream in Genesis, and the location where the Israelites built a temple to worship in the book of Kings. Although mentions of Ramallah can be found throughout historical texts, modern Ramallah was founded in the mid 1500s by the Hadadeens, a tribe of brothers who were descended from Yemenite Christian Arabs. Ramallah is also famous for the Mukata'a which now serves as the governmental headquarters of the Palestinian Authority in Ramallah. The Mukata'a also recently became known as "Arafat's Compound." The Israeli settlement of Bet El is located, just east, adjacent to Ramallah. Tulkarm or Tulkarem (Arabic: طولكرم‎ Ṭūlkarm; Hebrew: טול כרם) is a Palestinian city in the West Bank. The city's origins can be traced back to at least the third century C.E. under the name "Berat Soreqa", and in later centuries as "Tur Karma" ( Aramaic: טור כרמא), which means “mount of vineyards” in Aramaic, as the city is known for the fertility of the land and the vines around it. Avnei Hefetz[, Sal'it and Einav are three Israeli settlements nearby. Nablus is a major city of over 100,000 Palestinians and lies between the two mountains of Ebal and Gerizim. It is the location of the Palestine Securities Exchange and is also famous for its Knafeh. The city is referred to as Shechem in Hebrew, a Biblical city. Ancient Shechem is located in the eastern part of the modern city, in a site known as Tel Balatah. An ancient city with a rich history, Nablus is a site of religious significance to the three major Abrahamic faiths, and is also a scene of political instability related to the Israeli-Palestinian conflict. Before its destruction in 2000, Joseph's Tomb was located in Nablus. Jenin was known in ancient times as the Biblical village of En-gannim (Biblical Hebrew עֵין־גַּנִּים ʻĒn-Gannīm, "gardens spring"), a city of the Levites of the Tribe of Issachar. The modern Arabic name Jenin ultimately derives from this ancient name. 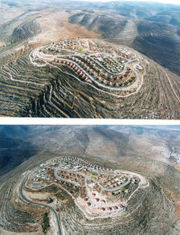 The State of Israel built a nearby Israeli settlement, Ganim, also named after the ancient village. This settlement was evacuated in August 2005 as part of Israel's unilateral disengagement plan. In April 2002, Jenin's refugee camp was the theatre of one of the most intense battles to occur during the al-Aqsa Intifada. Israel was widely pilloried in by international journalists and diplomats for what was called the "Jenin massacre" -- a false allegation made by Palestinian officials that the IDF killed hundreds of civilians in the camp. Extensive investigation by the United Nations found that no such massacre took place. Ariel (Hebrew: אריאל) is an Israeli settlement located north of the Palestinian town of Salfit on the West Bank, in the Biblical region of Samaria near the ancient village of Timnat Serah. Founded in 1978, its population as of 2004 is 16,414, including 7,000 immigrants from the former Soviet Union. It is the fifth largest settlement in the territories that Israel gained control from Jordan of as a result of the Six Day War in 1967. The Israeli Ministry of the Interior gave the municipality of Ariel the status of a city in 1998. Ariel is home to the College of Judea and Samaria, founded in 1982. Current enrollment is 8,500 students, consisting of both Jewish and Arab students. In 2005, the Israeli government decided to allow the college to attain university status. Hebron is a city of paramount importance to Jews, Christians, and Muslims. Prior to the 1929 Palestine riots, all three populations lived together in the city. It is the location of Ruth and Jesse's tombs, as well as many ancient synagogues and mosques. 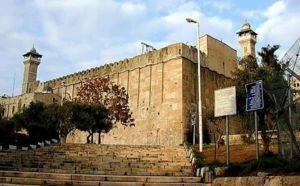 The Cave of the Patriarchs is considered to be the spiritual centre of Hebron. Kiryat Arba is an urban Israeli settlement adjoining the city of Hebron. Biblically, it is generally regarded as another name for Hebron. Jewish settlers founded Kiryat Arba immediately to the east of Hebron. The population in 2005 was approximately 6,500, with an additional 2,700 Israelis living in a number of smaller surrounding settlements. Bethlehem, which is south of Jerusalem, has great significance for Christianity as it is believed to be the birthplace of Jesus of Nazareth and the Church of the Nativity. The traditional site of Rachel's Tomb, which is important in Judaism, lies at the city's outskirts. Bethlehem is also home to one of largest Christian communities in the Middle East. The Bethlehem agglomeration includes the small towns of Beit Jala and Beit Sahour, the latter also having biblical significance. The equally remote Greek Orthodox monastery of Mar Saba lies hidden along a silent, empty wadi 15 miles east of Bethlehem. Jericho, an oasis town in the Jordan Valley, is one of the oldest cities on Earth. It is mentioned in the Biblical book of Joshua as the first location that the Israelites conquered when entering the new land. The city was miraculously conquered when the Israelites circled the city's wall seven times and then it collapsed. Jericho has a population of approximately 19,000. It is believed by some to be the oldest continuously inhabited settlement in the world. Many archeological sites are located in this city. Also on September 16, 1998, a medium-sized casino and hotel, jointly called Oasis, were opened on the southern outskirts of Jericho. Jericho is also the site of Palestinian prisons. Outside Jericho, Nabi Musa is an austere, colonnaded mosque built by a Mamluk sultan at the place where Moses is reportedly buried, according to the Muslims. The 12th-century Monastery of the Qurantul on the Mount of Temptation is built on a majestic site where Jesus is believed to have fasted for 40 days while tempted by the devil. Mitzpeh Yericho is the Jewish settlement next to Jericho. Gush Etzion (Hebrew: גוש עציון, lit. bloc of the tree) is a group of Israeli settlements in the northern Judea region of the West Bank. The first modern Jewish attempt to settle the area was in 1927 by a group of Yemenite Jews who founded an agricultural village. The location was purchased because it was roughly equidistant from Bethlehem and Hebron, and thus fell between the zones of influence of the local Arab clans. Two years later, the 1929 Palestine riots and recurring hostilities forced the group to flee. 1935 saw the founding of Kfar Etzion, for which the bloc is named, but this attempt was halted by the 1936-1939 Arab revolt in Palestine. Four kibbutzim were ultimately founded after another attempt in 1943; they were destroyed a week before Israel's founding amid the Kfar Etzion massacre. Jewish settlement resumed after the 1967 Six Day War. Today the bloc is home to over 40,000 Israelis in two urban centers and 18 towns and villages. The Jordan Valley is a low-lying strip which cleaves down the western border of the country. It is part of the Great Rift Valley, which extends down southwards into East Africa. Since 1967, every Israeli government has considered the Jordan Valley to be the "eastern border" of Israel and has sought to strengthen the Israeli presence there. To strengthen its hold on the area, Israel has established 26 settlements and five Nahal brigade encampments there, which house some 7,500 residents. Over the years, most of the area has been declared state land and was attached to the jurisdictional area of the Jordan Valley Regional Council, which includes most of the settlements in the valley. Recently, Prime Minister Ehud Olmert stated in a TV interview that the Jordan Valley will remain under Israeli control in any future agreement. Adora, Alei Zahav, Alfei Menashe, Almog, Almon (Anatot), Alon, Alon Shvut, Argaman, Asfar, Ateret, Avnei Hefetz, Barqan, Bat Ayin, Beit Arye, Beit El, Beit Ha´arava, Beit Horon, Beitar Illit, Bqa´ot, Bracha, Carmel, Chemdat, Dolev, Efrat (Efrata), El´azar, Eli (town), Elkana, Elon More, Enav, Eshkolot, Etz Efraim, Ganim (evacuated), Geva Binyamin, Gilgal, Gitit, Giv´at Ze´ev, Giv´on Ha´hadasha, Gva´ot, Haggai, Halamish, Hamra, Har Adar, Hashmonaim, Hermesh, Hinanit, Homesh (evacuated), Immanuel, Itamar, Kadim (evacuated), Kalia, Karmei Tzur, Karnei Shomron, Kedumim, Keidar, Kfar Adumim, Kfar Etzion, Kfar Ha´oranim (Menorah), Kfar Tapuah, Kiryat Arba, Kiryat Netafim, Kochav Ha´shachar, Kochav Ya´akov, Ma´ale Amos, Ma´ale Efraim, Ma´ale Levona, Ma´ale Michmash, Ma´ale Shomron, Ma´on, Masu´a, Matityahu, Mechola, Mechora, Metzadot Yehuda, Mevo Dotan, Mevo Horon, Migdal Oz, Migdalim, Mitzpe Shalem, Mitzpe Yericho, Modi´in Illit, Na´ale, Na´ama, Nahaliel, Negohot, Netiv Ha´gdud, Neve Daniel, Nili, Niran, Nofei Prat, Nofim, Nokdim, Ofarim, Ofra, Oranit, Otniel, Pedu´el, Petzael, Pnei Hever, Psagot, Rechelim, Reihan, Revava, Rimonim, Ro´i, Rosh Tzurim, Rotem, Sal´it, Sha´arei Tikva, Shadmot Mehola, Shaked, Shani (Livne), Shavei Shomron, Shilo, Shim´a, Shvut Rachel, Susiya, Talmon, Telem, Tene, Tko´a, Tomer, Tzofim, Vered Yericho, Yafit, Yakir, Yitav, Yitzhar. The region did not have a separate existence until 1948–9, when it was defined by the Armistice Agreement between Israel and Jordan. The name "West Bank" was apparently first used by Jordanians at the time of their annexation of the region, and has become the most common name used in English and related languages. The term literally means 'the West bank of the river Jordan'; the Kingdom of Jordan being on the 'East bank' of this same river Jordan. Prior to this usage of the name "West Bank", the region was commonly referred to as Judea and Samaria, its long-standing name. For example, U.N. Resolution 181, The 1947 Partition Plan explicitly refers to part of the area as Judea and Samaria. For region boundaries set forth in the resolution see the text here. Israelis refer to the region either as a unit: "The West Bank" (Hebrew: "ha-Gada ha-Ma'aravit" "הגדה המערבית"), or as two units: Judea (Hebrew: "Yehuda" "יהודה") and Samaria (Hebrew: "Shomron" "שומרון"), after the two biblical kingdoms (the southern Kingdom of Judah and the northern Kingdom of Israel — the capital of which was, for a time, in the town of Samaria). The border between Judea and Samaria is a belt of territory immediately north of Jerusalem sometimes called the "land of Benjamin". The name Judea and Samaria has been in continual use by Jews as well as various others since biblical times. This name carries an emotional meaning to many Jews as the cradle of Jewish Nation is derived from the time of King David in the region, the main religious sites and tombs are present there, and continuos Jewish communities were concentrated in the area throughout the years. The Israeli settlement of Ma'ale Levona, with a 2004 population of 514, between Ramallah and Nablus, from different angles. The neo-Latin name Cisjordan or Cis-Jordan (literally "on this side of the [River] Jordan") is the usual name in most Romance languages, in part out of the logical argument that the word "[river] bank" should not be applied to a mountainous region. The analogous Transjordan has historically been used to designate modern-day Jordan which lies on the "eastern banks" of the River Jordan. In English, the name Cisjordan is also used to designate the entire region between the Jordan River and the Mediterranean Sea, particularly in the historical context of the British Mandate. The use of Cisjordan to refer to the smaller region discussed in this article is extremely rare; the name West Bank is standard usage for this geo-political entity. For the low-lying area immediately west of the Jordan, the name Jordan Valley is used instead. The future status of the West Bank, together with the Gaza Strip on the Mediterranean shore, has been the subject of negotiation between the Palestinians and Israelis, although the current Road Map for Peace, proposed by the " Quartet" comprising the United States, Russia, the European Union, and the United Nations, envisions an independent Palestinian state in these territories living side by side with Israel (see also proposals for a Palestinian state). The Palestinian people believe that the West Bank ought to be a part of their sovereign nation, and that the presence of Israeli military control is a violation of their right to self-determination. The United Nations calls the West Bank and Gaza Strip Israeli-occupied (see Israeli-occupied territories). The United States generally agrees with this definition. Many Israelis and their supporters prefer the term disputed territories, claiming it comes closer to a neutral point of view; this viewpoint is not accepted by most other countries, which consider "occupied" to be the neutral description of status. According to the Camp David Accords (1978) with Egypt, the 1994 agreement with Jordan and the Oslo Accords with the PLO, the final status of the territories would be fixed only when there was a permanent agreement between Israel and the Palestinians. Complete or partial withdrawal from the West Bank in hopes of peaceful coexistence in separate states (sometimes called the " land for peace" position); (According to a 2003 poll 76% of Israelis support a peace agreement based on that principle). Transfer of the East Jerusalem Palestinian population (a 2002 poll at the height of the Al Aqsa intifada found 46% of Israelis favoring Palestinian transfer of Jerusalem residents; in 2005 two polls using a different methodology put the number at approximately 30%). Israeli settlements on the West Bank beyond the Green Line border are considered by some legal scholars to be illegal under international law. Other legal scholars (including prominent international law expert Julius Stone), have argued that the settlements are legal under international law, on a number of different grounds. The Independent reported in March 2006 that immediately after the 1967 war Theodor Meron, legal counsel of Israel's Foreign Ministry advised Israeli ministers in a "top secret" memo that any policy of building settlements across occupied territories violated international law and would "contravene the explicit provisions of the Fourth Geneva Convention". A contrasting opinion was held by Eugene Rostow, a former Dean of the Yale Law School and undersecretary of state for political affairs in the administration of U.S. President Lyndon Johnson, who wrote in 1991 that Israel has a right to have settlements in the West Bank under 1967's UN Security Council Resolution 242. It is the policy of both Israel and the United States that the settlements do not violate international law, although the United States considers ongoing settlement activity to be "unhelpful" to the peace process. Israel also recognizes that some small settlements are "illegal" in the sense of being in violation of Israeli law. In 2005 the United States ambassador to Israel, Dan Kurtzer, expressed U.S. support "for the retention by Israel of major Israeli population centres [in the West Bank] as an outcome of negotiations", reflecting President Bush's statement a year earlier that a permanent peace treaty would have to reflect "demographic realities" on the West Bank. The Conference of High Contracting Parties to the Fourth Geneva Convention held in Geneva on 5 December, 2001 called upon "the Occupying Power to fully and effectively respect the Fourth Geneva Convention in the Occupied Palestinian Territory, including East Jerusalem, and to refrain from perpetrating any violation of the Convention." The High Contracting Parties reaffirmed "the illegality of the settlements in the said territories and of the extension thereof." The Israeli West Bank barrier is a physical barrier being constructed by Israel consisting of a network of fences with vehicle-barrier trenches surrounded by an on average 60 meters wide exclusion area (95%) and up to 8 meters high concrete walls (5%). The barrier generally runs along or near the 1949 Jordanian-Israeli armistice/ Green Line, but diverges in many places to include on the Israeli side several of the highly populated areas of Jewish settlements in the West Bank such as East Jerusalem, Ariel, Gush Etzion, Emmanuel, Karnei Shomron, Givat Ze'ev, Oranit, and Ma'ale Adummim. Because of the complex path it follows, most of the barrier is actually set in the West Bank, with the result that many Israeli settlements in the West Bank remain on the Israeli side of the barrier, and some Palestinian towns are nearly encircled by it. The proponents of the barrier claim that its route is not set in stone, as it was challenged in court and changed several times. The West Bank barrier is justified by Israel as being necessary to deter Palestinian attacks against Israeli civilians, but it has been subject to criticism by the international community. 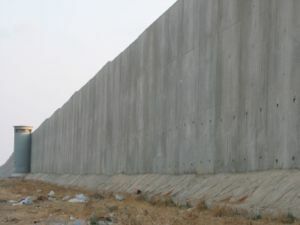 In October 2003 the issue of the barrier was considered by the UN Security Council where the US vetoed a resolution criticising its construction. Later in the same month the General Assembly passed a resolution (non-binding) calling for Israel to stop and reverse the construction of the barrier. The vote was 144 in favour, including all of the EU countries, and 4 against including the US. Subsequently the General Assembly passed the matter to the International Court of Justice (ICJ). The ICJ found in a non-binding advisory opinion that the construction of the barrier was contrary to international law and that Israel should cease construction, dismantle existing structures and make reparations for loss and damage involved. The Court also ruled that all States 'are under an obligation not to recognize the (...) wall and under an obligation not to render aid or assistance'. The 1948 Armistice Agreements established the "Green Line" separating the territories held by Israel and its neighbors. During the 1950s, there was a significant influx of Palestinian refugees and violence together with Israeli reprisal raids across the Green Line. In the Six-Day War of 1967, Israel captured this territory, and in November, 1967, UN Security Council Resolution 242 was unanimously adopted. All parties eventually accepted it and agree to its applicability to the West Bank. Areas B and C constitute the majority of the territory, comprising the rural areas and the Jordan River valley region, while urban areas – where the majority of the Palestinian population resides – are mostly designated Area A. The West Bank has 4,500 km of roads, of which 2,700 km are paved. In response to shootings by Palestinians, some highways, especially those leading to Israeli settlements, are completely inaccessible to cars with Palestinian license plates, while many other roads are restricted only to public transportation and to Palestinians who have special permits from Israeli authorities . Due to numerous shooting assaults targeting Israeli vehicles, the IDF bars Israelis from using most of the original roads in the West Bank. Israel's longstanding policy of separation-to-prevent-friction dictates the development of alternative highway systems for Israelis and Palestinian traffic. Israel maintains 50+ checkpoints in the West Bank . As such, movement restrictions are also placed on main roads traditionally used by Palestinians to travel between cities, and such restrictions have been blamed for poverty and economic depression in the West Bank . Since the beginning of 2005, there has been some amelioration of these restrictions. According to recent human rights reports, "Israel has made efforts to improve transport contiguity for Palestinians travelling in the West Bank. It has done this by constructing underpasses and bridges (28 of which have been constructed and 16 of which are planned) that link Palestinian areas separated from each other by Israeli settlements and bypass roads" and by removal of checkpoints and physical obstacles, or by not reacting to Palestinian removal or natural erosion of other obstacles. "The impact (of these actions) is most felt by the easing of movement between villages and between villages and the urban centres" . However, the obstacles encircling major Palestinian urban hubs, particularly Nablus and Hebron, have remained. In addition, the IDF prohibits Israeli citizens from entering Palestinian-controlled land (Area A). A section of the Israeli West Bank barrier. The West Bank has three paved airports which are currently for military use only. The only civilian airport of Atarot Airport in northern Jerusalem, which was open only to Israeli citizens, was closed in 2001 due to the Intifada. Palestinians were previously able to use Israel's Ben Gurion International Airport with permission; however, Israel has discontinued issuing such permits, and Palestinians wishing to travel must cross the land border to either Jordan or Egypt in order to use airports located in these countries . The Israeli Bezeq and Palestinian PalTel telecommunication companies provide communication services in the West Bank. The Palestinian Broadcasting Corporation broadcasts from an AM station in Ramallah on 675 kHz; numerous local privately owned stations are also in operation. Most Palestinian households have a radio and TV, and satellite dishes for receiving international coverage are widespread. Recently, PalTel announced and has begun implementing an initiative to provide ADSL broadband internet service to all households and businesses. Israel's cable television company 'HOT', satellite television provider ( DBS) 'Yes', AM & FM radio broadcast stations and public television broadcast stations all operate. Broadband internet service by Bezeq's ADSL and by the cable company are available as well. Before 1967 there were no universities in the West Bank (except for the Hebrew University in Jerusalem - see below). There were a few lesser institutions of higher education; for example, An-Najah, which started as an elementary school in 1918 and became a community college in 1963. As the Jordanian government did not allow the establishment of such universities in the West Bank, Palestinians could obtain degrees only by travelling abroad to places such as Jordan, Lebanon, or Europe. Bethlehem University, a Roman Catholic institution partially funded by the Vatican, opened its doors in 1973 . In 1975, Birzeit College (located in the town of Bir Zeit north of Ramallah) became Birzeit University after adding third- and fourth-year college-level programs . An-Najah College in Nablus likewise became An-Najah National University in 1977 . Al-Quds University, whose founders had yearned to establish a university in Jerusalem since the early days of Jordanian rule, finally realized their goal in 1995 . Also in 1995, after the signing of the Oslo Accords, the Arab American University—the only private university in the West Bank—was founded in Jenin, with the purpose of providing courses according to the American system of education . In 2005, the College of Judea and Samaria in Ariel was approved to become a full fledged university . This move to create a university within an Israeli settlement has angered some Palestinians, although no official response was made by the Palestinian authority. The Hebrew University of Jerusalem, established in 1918, is one of Israel's oldest, largest, and most important institutes of higher learning and research. During the 1948 Arab-Israeli War, the leader of the Palestinian forces in Jerusalem, Abdul Kader Husseini, threatened that the Hadassah Hospital and the Hebrew University would be captured or destroyed "if the Jews continued to use them as bases for attacks". Medical convoys between the Yishuv-controlled section of Jerusalem and Mount Scopus were attacked since December 1947. After the Hadassah medical convoy massacre in 1948, which also included university staff, the Mount Scopus campus was cut off from the Jewish part of Jerusalem. After the War, the University was forced to relocate to a new campus in Givat Ram in western Jerusalem. After Israel captured East Jerusalem in the Six-Day War of June 1967, the University returned to its original campus in Mount Scopus. Most universities in the West Bank have politically active student bodies, and elections of student council officers are normally along party affiliations. Although the establishment of the universities was initially allowed by the Israeli authorities, some were sporadically ordered closed by the Israeli Civil Administration during the 1970s and 1980s to prevent political activities and violence against the IDF. Some universities remained closed by military order for extended periods during years immediately preceding and following the first Palestinian Intifada, but have largely remained open since the signing of the Oslo Accords despite the advent of the Al-Aqsa Intifada in 2000. The founding of Palestinian universities has greatly increased education levels among the population in the West Bank. According to a Birzeit University study, the percentage of Palestinians choosing local universities as opposed to foreign institutions has been steadily increasing; as of 1997, 41% of Palestinians with bachelor degrees had obtained them from Palestinian institutions . According to UNESCO, Palestinians are one of the most highly educated groups in the Middle East "despite often difficult circumstances" . The literacy rate among Palestinians in the West Bank (and Gaza) (89%) is third highest in the region after Israel (95%) and Jordan (90%) .